What is outline? Outline is the structure of a source document. It also called document map. 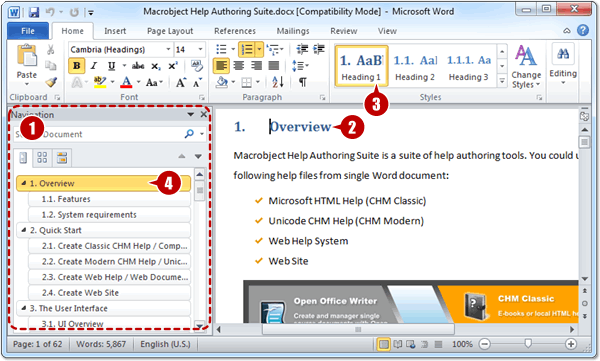 Help Authoring Suite creates the topic tree of the Help System according to the outline of the source document. What are headings? Headings are sentences or phrases formatted with a built-in heading style (Heading 1 through Heading 9) or outline level (Level 1 through Level 9) in the source document. 1. Document map / outline, Macrobject Help Authoring Suite creates the help topic tree according to this outline. 3. The level 1 topic is formatted with the style “Heading 1”. Level 2 topics are formatted with style “Heading 2” and level 3 topics are formatted with style “Heading 3”. Before creating the Help System, please make sure the source document includes a proper outline. Open the Document Map Panel and exam if the outline is exactly what you want.